Marina del Rey Toyota’s dealership in Los Angeles will be used as a polling place for the upcoming primary elections on Tuesday March 3rd, 2015 and the general election on May 19th, 2015. Polling booths will be located in the showroom of our dealership, so be sure to check out some of our latest models while you wait in line. Are you an early bird? Come early in the morning and we’ll have complimentary coffee and pastries waiting for you. Our booths will be open from 6 am to 9:30 pm. You can visit our dealership at 4636 Lincoln Blvd., Marina del Rey, CA 90292. 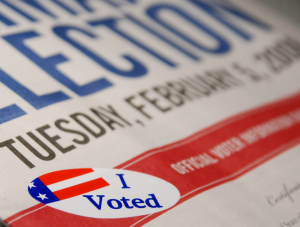 For all general election-related inquiries, please contact the Office of the City Clerk – Election Division between 8:00 a.m. and 5:00 p.m., Monday through Friday, at (213) 978-0444 or toll-free at (888) 873-1000. You can also visit them on the web to learn more about the candidates at http://clerk.lacity.org. For more information on voting at Marina del Rey Toyota, please give us a call at 888-834-3068.